There are a few nice venue to enjoy concert in Malaysia. 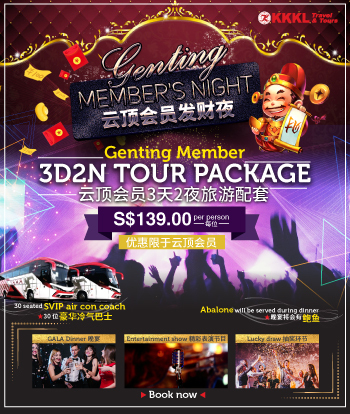 Apparently Genting Highlands is one of it. Chill and breeze weather is appreciated by people here who lives in summer all year long. Asia’s beloved ballad singer, Fei Yu Ching, returns to serenade us one last time before he steps away from the limelight in May 2019. The Taiwanese singer shot to stardom with his melodious and distinctive voice, and belted popular hits such as 《一剪梅》，《晚安曲》，《梦驼铃》，and many more. Bii, Victor Wong, Jeno Liu, Roger Yang, Fuying & Sam gather together and perform together in one single concert. With this awesome line-up, I’m sure its hard to hold yourself for not attending this concert. 毕书尽，品冠，刘力扬，杨培安， Fuying & Sam 一起到云顶高原开唱。面对着这么鼎盛的阵容，是否拒绝不了诱惑呢?? Queen of the silver screens, Nancy Wu, was a singer first and actress second. After clinching 4th place in a TVB singing competition in 1999, she began an illustrious acting career which saw her become a household name to Cantonese drama fans everywhere. Now making a comeback to the stage, Wu’s loyal fans can expect classics like <日月>, <從未知道你最好>, <得寵>, <我有我美麗>, <無悔無愧> and <明月與海>, only at the Arena of Stars! A 90s heartthrob, Leon Lai captured the hearts of many with his melodious voice and incredible talent. With a strong supporting fan base, he clinched the title of Best Newcomer at the Hong Kong annual music awards. Not only does his talent lie in singing, his foray into the acting world has also reaped rewards with titles like Best Actor at the Golden Horse Awards. The TVB show ‘Life on the Line’ hits the road with a special staging of ‘Life on the Beat in Genting’. Filled with drama, romance, and a slight dose of vengeance, this medical drama is gripping as it is interesting. Watch rescue teams take on life and death scenarios while dealing with pain, loss and solitude. Starring Joe Ma, Matthew Ho, and Kelly Cheung, be sure to catch this stage-to-screen exclusive! Elaine Kang started her debut in the 1980s, from then she has a collection of an astonishing 30 albums to her name (26 Chinese, 1 English and 3 Malay). As an all-round performer, Elaine also dabbled in the arena of acting and hosting programmes. She has also performed at the ASEAN Top Queen Festival, which was held in various countries including Japan, Singapore, Indonesia, Taiwan, China and Hong Kong. Her contributions to the music industry have earned her an Honorary Fellowship conferred by the London College of Music in UK. Elaine Kang became the first artiste in the Malaysian Book of Records to record a Chinese album with the Penang State Symphony Orchestra with support from the State Government.